Add your queries in the Leave a Reply space below and start discussions. You can share ideas with electronics people. perfectly on the PCB implementation but i also did not expect it to work so well at 2.4GHz DECT frequency but not 2.0GHz WCDMA. I have attached the design with pcb layout and hope you can possibly suggest some changes to try to bring the sensitivity back down to the lower frequency. Thanks for the mail. I expect this kind of experimentation to make a circuit more reliable and perfect. As you know, the 0.22 capacitor is the tricky component of the circuit. I have found out this by testing with a number of caps.0.22 capacitor is a large sized one with large surface area and long leads. The important thing I found out during experimentation is that, the frequency detection varies with the lead length of the cap. I tried to get 2.5 GHz by trimming the lead to 18mm length. If it is 20 mm or 16 mm, the frequency detection changes.So experiment with 0.22 cap by trimming its lead length. You can fix it as 2GHz. and the very useful document. I was so puzzled that the solderless and PCB versions both seemed to work well with the DECT phone but not the WCDMA mobile that i placed both solderless breadboard and PCB version together side-by-side on top of the mobile phone. Viola! Both started to work!I removed the solderless breadboard and the PCB version still worked. I then discovered that the PCB version had to be placed in very close proximity to the antenna on the mobile phone(usually at the top) and i had just so happened to have set it up this way while testing with the solderless breadboard. I now understand more about how it works and can explain the differences in our PCB designs which are probably giving rise to differences in operation. a) I use a 100nF disc ceramic, not being able to easily source a 220nF. I guess the larger diameter 220nF will probably pick up more signal and increase the detection signal and range. b) On my PCB, the 100nF disc leads are cut very short, soldered to the end of the pcb trace (marked CAP) and the pcb trace acts as the 18 x 8mm capacitor leads. This seems to work very well (as proven by the 2.4GHz DECT!) but capacitor is in the horizontal plane of the PCB so appears to make the overall detection less sensitive and i need to place the GigaHz antenna directly above/close to the WCDMA mobile antenna. In your version, the capacitor is mounted vertically and positioning may not be as important (as i found out from the same tests carried out with the solderlessbreadboard – vertically mounted 100nF capacitor). c) I have top/bottom layer ground planes on my pcb. d) I use the CA3140 instead of CA3130 and have a different biasing circuit to comply with LiPo battery powering. The spec for CA3130/40 says it is guaranteed to work at Vs = 4V but i found that they are operational down to about 3.2V which is fine for LiPo battery. Hope i have been able to give you more insight into your original design. As you rightly say, you can only really learn by experimenting and trying things out. Where would we be if Maxwell did not play with electro-magnets or Edison with electricity and filaments?. Hope you continue to make more interesting discoveries. You can sign up and follow using e-mail. So that, you will get updates via mail. The Sign up button is in the front page. Sir i have some problem in runing this circuit pls guide me. i am not getting proper output. It is having a lot of disturbance and the audio is not audible cause of disturbance. Pls guide me. It hears like a radio with poor signal. Use a regulated power supply or battery. Unregulated power supply induce hum. Use a high value 2200 uf Capacitor in the power supply for smoothing. Ground the negative rail to the metal body of case. One suggestion I want to give you that on this page right side link to sub pages color is dimmed (not showing visible clearly). Kindly change the font and color to view these texts. Thanks. I have sent you the picture of frequency but still waiting reply from you. I further worked on it. Now result is that without touching any thing with probe, frequency counter showing reading 129. What I have to do. Please reply me as soon as received this message. I saw this website when I was searching tutorial for cd4033. Some things now clear in my mind. I am making Frequency Counter Circuit which was I saw in CMOS ICs Book. In circuit using 3 cd4017 (3rd IC output 9 sec. Low and I sec. High). This output further drives cd4001 (cd4001 works same time reset and low chip enable pin of cd4033). Problem is that when I am touching two output of 4001 one for reset and other for CE pin of CD4033. The 7-segment showing 00 continuously. When I interchange the output behavior is not good. Kindly help me in this matter. There is no option found to add picture of circuit. Kindly add this option. Thanking you for your circuit ‘live wire scaner’. I just made it and it is woking fine(LED blinking) on a live wire from a distance of 6-10 inches. But I am facing some problem which needs your suggetion. Many times led is continiously glowing in full or dim condition like faulse triggering. obstruction between the wire and the antena, the circuit stops working. I am using red led (100R is correct?) , HCF4033BE ic, 9 volt pack battery (as 12v car remote battery not available with me now). I am a hobbist in electronics and made many of your circuits sucsessfully.Now i am tring to build your ac tester ( contactless 50hz detecter using 555 ic but it will not work efficiently from 1 feet distance, it will work only from one or two inches. The circuit is needed for consealed wiring. I was previously made a circuit of rf signal detecter using ic 324 collecting from the net ,it works well from a distance upto 6 inches but that circuit also failed to detect ac hums from the consealed wiring or switchboard. It only works well on a wire or a huge electrical field like fan choke etc. I also made your non-contact power moniter, it works well but the same problem of detection of mains under the pluster or wall is occured. I used pocket radio antena in all cases. Sir, i could not understand the problem. only you can slove it. thankig for your early response. i shall be ever greatful to you. I am still waiting for a response from you to my query posted here on Aug03, 2012. Thanks for replying back. Regarding: “Design Your Circuit. Part IX – VG 40 T / R Radio Remote Control switch”, I downloaded the product list from Vegakit but could not find the VG40T and VG40R pair to order. I also searched the Vegakit website without any results. Can you please provide me the exact URL of the same from Vegakit’s website or the part number etc, so that I can order it or can you please tell me under which category/section in Vega Kit’s website I should find the VG40 T abd VG40 R pair? Apart from this, why don’t you publish an easy to build compact RF based remote control switch to remotely switch on-off a load with a range of 40-50 mtrs? thanks for the guidance sir.Pls tel one more thing,is rest of the circuit wil remain same,if i use CA3130 or CA3140. I have made a mini project seismic sensor.But in it i had choose ur circuit diagram where u use LM741 instead of TL071,but i am unable to find the circuit description of same.Pls send me the circuit description of same,i readlly need that,coz i have to submit my project. It is difficult to get good result with 741 IC. TL0 71 is a JFET input OP AMP. Sensitive op amp is necessary. If TL0 71 is not availavle, use CA3130 or CA3140. It is common that mosquito swatters last for a short period of time. What are the main components that can fail and also how to check them? I have gone through the SOLAR POWERED LED circuit in your blog;it is a good circuit but it costs way beyond the self imposed financial limits set by me !it may cost perhaps over Rs.1000; at the least;solar panels are Rs.100 a watt and this design needs 5 watt panel?,the one watt leds may cost rs.50 each; such light with a polycrystalline integrated panel on top,the best i have seen is S10 from d.light design priced at Rs.500; the brightness is good enough for a 100 sq.feet hut. it lasts for 18 months when the rechargeable battery needs replacement. Assuming that the sandya deepam[ name borrowed from Amritha channel program] made by us is used daily for four hours x 30 days=120hrs new batteries are needed,at Rs60/month.Affordable from the saving in kerosene. and most importantly the batteries are available in the local shop.it will be a stand alone utility and does need running about for batteries. so starting with a 6-volts current source,what will be the best circuit that can light up a hut for a mother to cook food+provide light for a child to read a book [sitting near it] for daily 4 hours for 30 days. ;the super flux leds i got need 70 milliamps of forward current and 3 volts of forward voltage. I seek a circuit + specifications for the resistor/diode/transistor/switch/pcb and suppliers.i will make a housing from bamboo.I seek a solution .Thanks a million. we have some similarity ! i am also a zoology M.Sc from BHU and of 1955 vintage! retired as chief conservator of forests in 1993;Got interested in electronics lately and specifically in LED lamps for tribal communities. Most lanterns in the market are above Rs.500 to 3000 ;they are ok for the BOP but not for POP[poorest of poor];i am not for the solar powered rechargeable ones as these are costly and the battery is not available in these remote villages;Eveready brought out a set of lights based on their primary battery,more to boost the falling sales of their batteries; i find it is not impossible to make a led light for Rs.100;i have tested several prototypes with 1,2,3,4 chinese super flux Leds and they ran for 80 to 120 hours on 6volts[4 D size batteries];i seek your help for a circuit that maximises the use of power and brightness; for the housing i will use bamboo !this is a not-for profit project;suggestions are welcome from your experienced readers as well to rkraoifs@yahoo.com.HAPPY DEEPAVALI. Your interest in Electronics is nice. As you said, LED lights are becoming popular as a substitute for conventional lamps due to the need for energy saving. The ordinary White LED consumes only 30 milli ampere current and gives sufficient brightness. But the high power LEDs are 1-10 watt rated which requires 300 milli ampere current so that the battery will drain drastically. These LEDs are useful for short duration lighting or use in step down power from AC. But when compared to a lamp using many ordinary white LEDs, a single high power LED reduces the size of the lamp and gives increased brightness. If power supply is not available, solar charging is the only possible way to charge the battery.The commonly available 6 volt 4.5 Ah emergency battery is a good choice. It is readily available at the cost of Rs. 100-150. You may see the SOLAR POWERED LED circuit in the blog. It is a low cost one and simple. If you want specific requirements in the circuit, kindly send the details. thanks a million for your prompt response;i will go through your write up and get back to you;by any chance you know Dr.madhavn nair ,he was in BHU with me and joined the university in Thiruvananthapuram in the fifties ! Sir,i couldn’d find the disc capacitor (0.22uf) with 8mm lead spacing used in mobile bug circuit…can u plz send me the model no. of capacitor? 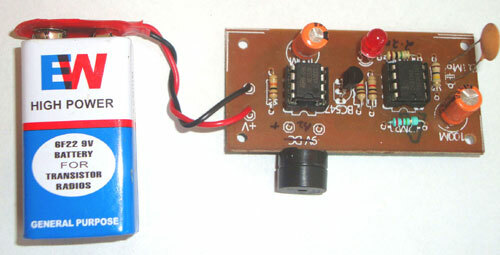 Mobile Bug circuit – 0.22 uF Disc capacitor is a commonly available one(Brown colored large disc). Its lead length is around 22 mm. Before soldering, trim the leads to 20 mm. During soldering, the gap between the the leads should be 8mm. You require the circuit or concept? I am M.tech -ECE 2nd year student.Kindly suggest me a innovative minor project. You may see the HOBBY PAGE, TOP CIRCUITS and PROJECT CORNER of the Blog to select the Minor Project . Which one is better mobile detector or skin response meter.Kindly suggest. Mobile phone Spying is the unauthorized recording or transmission of personal conversations. Snapping of Photos and Video recording without the permission of a person and its transmission via MMS or Bluetooth is illegal. why we are been using 555timer instead of giving direct connection to buzzer..
Can I ask for full details of the mobile sniffer? and also the components.. Thank you. but I’m having a problem regarding that transistor because it is not available in the market..
Sir, can the light detector circuit be modified?